In a continued effort to adapt its products to diverse needs of business owners, QuickBooks has recently introduced the all new QuickBooks Online Self-Employed made for all of us small business owners. When developing the new line, Intuit specifically had in mind independent contractors, freelancers, and sole proprietors who often use their credit cards and bank accounts for personal and business purposes. The product not only lets you easily separate between those two types of expenses, but also sorts all this data into categories, lets you attach digital copies of receipts, and provides uncomplicated connections to such aspects of self employments as income reporting and tax payments. Getting started with QuickBooks Self-Employed requires linking any bank accounts or credit cards you use operating your business. All you need to do is to identify the name of your financial institution and then log in to your account. Once you select the accounts to consider, QuickBooks will automatically import all transactions from your bank. From that moment on your job will be to determine whether a particular debit or credit is personal or business related. Waiting until the last moment to sort out your expenses is very burdensome and impractical. I can’t imagine sitting down and going over pages and pages of bank statements trying to remember the nature of a particular expense. It is more feasible to log into your account and review transactions on a daily or weekly basis. If you access your account from a computer, the software displays all the uncategorized expenditures and you just select a type of expense it was. If you review the transactions from your smart phone, swipe left to indicate business or right for personal expenses. Being able to do it from your smart phone allows you to optimize your time by doing it even if you have a spare 5 minutes while you’re waiting for your lunch to be served. There are instances when a single transaction needs to be split between business and personal. If you need more time to review it, just skip this transaction and go back to it later. QuickBooks will keep track of all transactions that still need to be classified and can even let you go back to old transactions and change their classification. One way to save time is to assign a rule for certain business or personal expenses. If all your purchases at Home Depot, for example, are business related, you can set that up as a rule and every time you import transactions to QuickBooks Self-Employed they will be assigned to that category and you won’t have to deal with them. You can further break down all expenses into Schedule C categories such as Materials & Supplies, Meals & Entertainment, Business Insurance, Utilities, Interest, etc. QuickBooks then searches for allowable deductions for each category. You can also add spending manually; if you paid cash or have a receipt but can’t find the transaction, provide a description and the amount, and select a Schedule C category. QuickBooks Self-Employed incorporates mileage-tracking feature as well. The way it works at the moment is that you enter trip information as you go, namely: date, trip purpose, and mileage. You can also manage that between multiple vehicles and the software does the rest of the calculations for you. Although it is not very automated yet, I expect Intuit will enhance that feature in the future to eliminate manual input. This section is one of the biggest benefits of this product giving you an immediate insight into how your business is doing. The one-page snapshot displays your current income, business expenses, estimated taxes, and year-to-date profit. You can play around and see your profit and different type of expenses on quarterly, monthly or biweekly basis to look for any seasonality or other trends that may be affecting your business. QuickBooks Self-Employed suggests the amount of quarterly estimated taxes to be paid, keeps track of dates when taxes are due with reminders, and helps fill out and report that information to the IRS. The recommended estimated taxes are based on the annual forecasted profits. Additionally you can add information about your other sources of income. For example, you may be just getting started with your business and still keeping your regular job expecting to receive a W2; you may also include similar information about your spouse. The idea is to refine the amount of recommended quarterly estimated tax payments to avoid any negative surprises. Once it’s time to pay estimated taxes QuickBooks Self-Employed helps you fill out 1040-ES voucher and mail it to the IRS or pay online (you must first enroll in eftps.gov). Last but not least, QuickBooks Self-Employed is directly connected to TurboTax and if you choose so, you can file your taxes that way. Information from QuickBooks Self-Employed will automatically populate appropriate sections of TurboTax Home & Business leaving you with a review process and providing any other information necessary to file taxes based on your personal and professional situation. It’s not as expensive as you may think – Normally QuickBooks Self-Employed costs $9.99 per month but they are having a promotion for new customers where you can get your first year of service for just $4.99. That’s a pretty good price especially when you consider QuickBooks Premier Desktop costs $499.99 and that’s without any of the additional add ons like credit card processing. 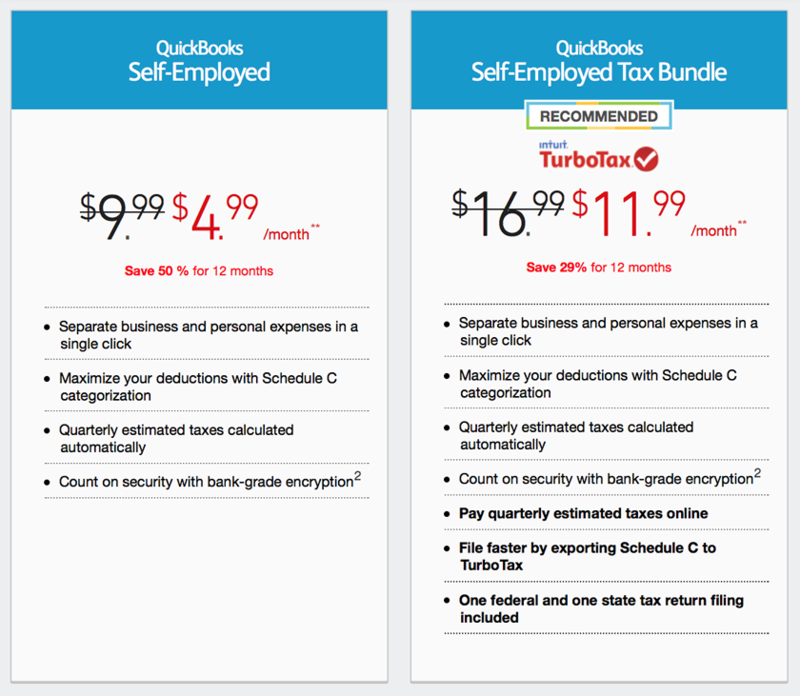 For a few bucks more, $11.99 per month and $16.99 thereafter, you also have the option of getting QBSE bundled with TurboTax. So once tax time rolls around, you won’t have to pay extra to file your tax return. QuickBooks Self Employed provides uncluttered and simple to follow interface to manage day-to-day business activities. Its integration with TurboTax and financial institutions allows you to spend the least amount of energy on sorting out the accounting portion of your business and focus instead on what you do best.